Disco ball earrings on New Year’s Eve, head-to-toe chartreuse on St. Patty’s Day, a pair of red, white, and blue cut-off shorts on July 4th… When it comes to major holidays, we’re usually willing to give the kitschy a pass. And while February 14th is often reserved for a bold red dress and some slinky heels, we’re eyeing something even more precious this year. 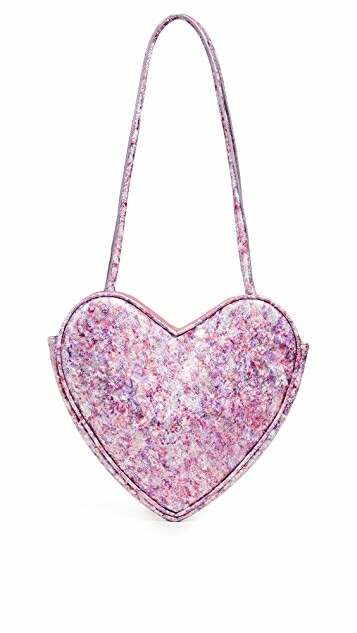 Heart-shaped handbags have been popping up on our radar since this past summer from Maryam Nassir Zadeh’s sparkly mini totes to Loeffler Randall’s ubiquitous beaded number. They’re compact, cute, and a reminder that we don’t always have to take fashion so seriously. And with those chalky sweetheart candies going completely m.i.a. this holiday, we’re going to need to a proper accessory fill the heart-shaped hole they’ve left behind. Whether you recognize this month’s upcoming festivities as Valentine’s Day, Galentine’s Day, or something else completely, lean into the love-infused accessories below.